World’s Best Folder Gluer Machines. Performance. Speed. Ease of Use. Durability. Profit. Kluge’s folding carton gluing machines empower you to produce precise, high-quality, sophisticated cartons and printed products, just the way you want them. With our folder gluers, set-up and production are easy and intuitive, with incredibly short make-ready times that lead the industry. But whereas some products trade quality for efficiency, Kluge’s machines turn out products that look great to your eye and feel first-class in your hand. In essence, our machines combine the user-friendliness you need for your workforce with the product integrity you want for your customers and end-of-line consumers. The Omni-Fold 3000 Automatic Folding and Gluing System is our newest folder-gluer machine, a fully modular converting system uniquely designed to meet the current needs, standards, and expectations of businesses like yours: commercial printer and packaging manufacturers who prize both efficiency and quality. Just as importantly, the Omni-Fold 3000 is designed to meet future demands too. Endlessly configurable, you can easily adapt the Omni-Fold 3000 to meet your current and/or future needs — and each configuration is easy for your staff to set up. Built to maximize converting capabilities while minimizing set-up time, the Omni-Fold 3000 establishes a new standard of excellence for folder-gluer machines. Learn more about the machine and its many configurations. Legacy Folder-Gluer Systems by KlugeKluge is proud to have pioneered two of the most widely used legacy folder gluers in the industry, still available and fully supported today. The UniFold Folder Gluer is a lighter, entry-level alternative to the Omi-Fold 300. While the Omni-Fold features certain unique design advancements, as a practical matter, the UniFold can be configured to achieve many of the same ends. Fully modular with a variety of configurations available, the UniFold allows your business to hit the ground running with excellent and cost-effective folding and gluing (with the option to add and grow as your business expands). Learn more about the UniFold and how it compares to the Omni-Fold 3000. It All Started with Kluge. It Continues with Kluge Today. When investing in solutions for your business, you want to make sure you’re engaging with companies that are not only innovators but also well-established in the field. We believe Brandtjen & Kluge, LLC represents the best of both those worlds. Indeed, the whole long history of our company has been defined by innovation at every turn. Kluge machines have driven the course of commercial printing & graphic arts finishing technology since the early 20th century. The Kluge revolution began in 1907, when John Brandtjen hired the Kluge brothers, Abel and Eneval, to join his then-fledgling print equipment firm. Together, they ushered in a quantum leap for the industry in 1931 when they introduced two new Kluge machines: the Model M and Model N, which together offered speeds of up to 4,000 impressions per hour for the very first time. We’ve been innovating ever since, committed to remaining at the forefront of our field. The Omni-Fold 3000 continues that tradition, as have all our legacy folder gluers, with Kluge machines actively in use at commercial printing companies all around the world today. Kluge folder gluers are carefully finished one at a time, each by an individual craftsman. Each person who works on a Kluge machine is effectively an expert in folder-gluer technology. Our professionals know how every part should fit, and they make sure they do fit before they leave our floor for yours. Unlike some other manufacturers, we individually assemble each Kluge product from parts that we have machined in-house, using our own state-of-the-art equipment. Part of the Kluge brand is a commitment to product inspections for adherence to our industry-highest quality standards. Every folder gluer is checked, re-checked, and tested endlessly in all its configurations before being crated and shipped. We provide extensive support for all our products, so when we promise an easy set-up and user-friendly operation, it’s a promise you can count on. 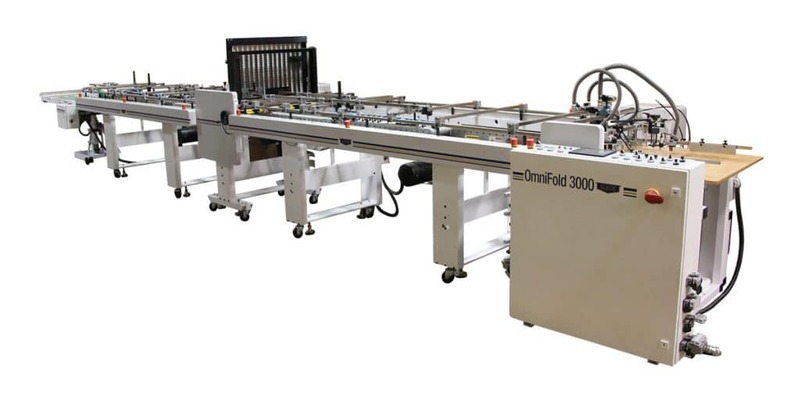 The Omni-Fold 3000 Automatic Folding and Gluing System is endlessly configurable. At Kluge, we aren’t just building machines. 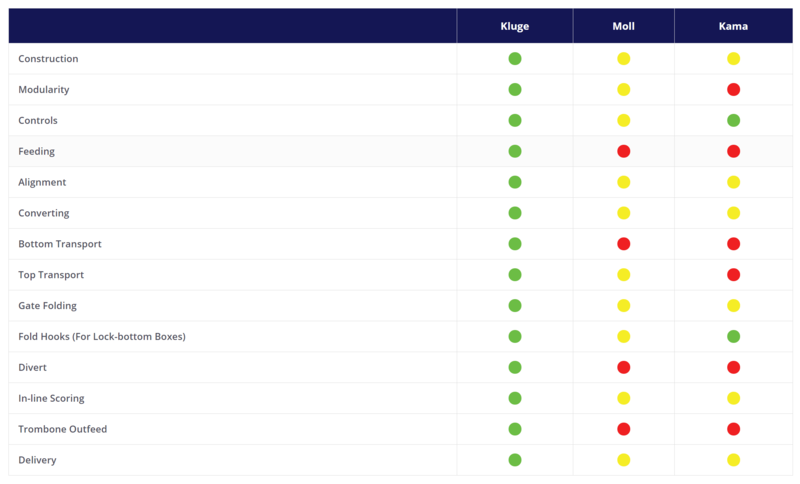 We’re building solutions for our customers. We understand that a folder gluer’s value is determined by how much it boosts your business, and each machine is designed and assembled with that metric in mind. Take your printing or finishing business to the next level. Put a solution in action and boost your bottom line. Get a quote for installing the Omni-Fold 3000, or one of our legacy folder gluers, today: call 866-501-7741 or contact us online.